This article introduces the concept of Android resources in Xamarin.Android and will document how to use them. It covers how to use resources in your Android application to support application localization, and multiple devices including varying screen sizes and densities. Code-Separation – Separates source code from images, strings, menus, animations, colors, etc. As such resources can help considerably when localizing. Target multiple devices – Provides simpler support of different device configurations without code changes. Compile-time Checking – Resources are static and compiled into the application. This allows the usage of the resources to be checked at compile time, when it will be easy to catch and correct the mistakes, as opposed to run-time when it is more difficult to locate and costly to correct. In the image above, the application resources are organized according to their type into these subdirectories: images will go in the drawable directory; views go in the layout subdirectory, etc. 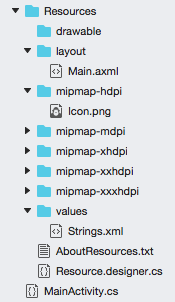 In the image above, the application resources are organized according to their type into these subdirectories: images will go in the mipmap directory; views go in the layout subdirectory, etc. 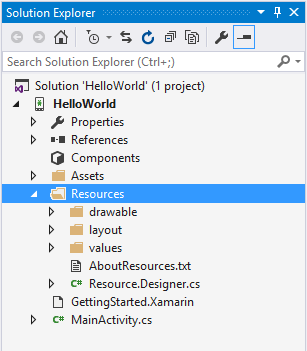 There are two ways to access these resources in a Xamarin.Android application: programmatically in code and declaratively in XML using a special XML syntax. These resources are called Default Resources and are used by all devices unless a more specific match is specified. Additionally, every type of resource may optionally have Alternate Resources that Android may use to target specific devices. For example, resources may be provided to target the user's locale, the screen size, or if the device is rotated 90 degrees from portrait to landscape, etc. In each of these cases, Android will load the resources for use by the application without any extra coding effort by the developer. Alternate resources are specified by adding a short string, called a qualifier, to the end of the directory holding a given type of resources. Android Resource Basics – Using default resources programmatically and declaratively, adding resource types such as images and fonts to an application. Device Specific Configurations – Supporting the different screen resolutions and densities in an application. 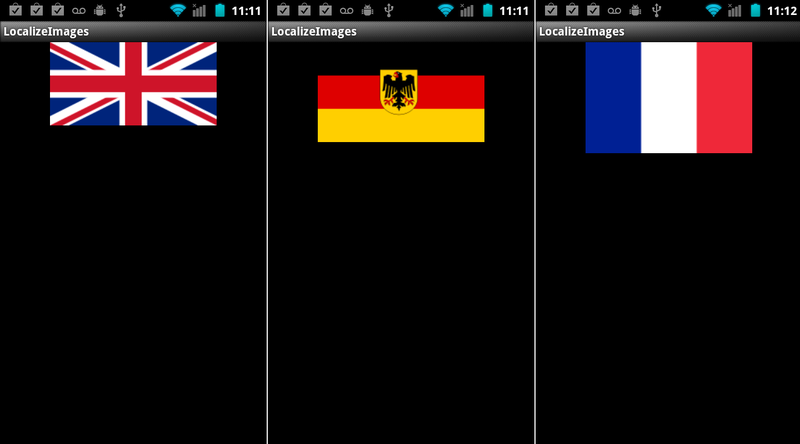 Localization – Using resources to support the different regions an application may be used.